In our house we are divided on how good milk is. I have always been the milk hound and my husband says milk is for kids. Well I never thought I would say I would use Silk Pure Almond instead of milk for some of my food choices. I was just as shocked I liked it as my husband was. I took the 10 day challenge and I am hooked on the Almond Milk now! The website Switch to Silk is a challenge to everyone to try the Silk products in place of what you would put milk in. They have three varieties to try, Silk Pure Almond, Silk Pure Coconut, and Simply Silk Soy. For my 10 day Challenge I tried Pure Almond with my breakfast of toast and blueberries, it was great. I tried it in my cereal, kinda a bit too sweet but I am sure the Simply Silk would have been better, I have that one on my to try list! But the BEST was when I added it to a shake. I put bananas, yogurt, blueberries and the Silk Pure Almond and I was in flavor heaven! It was soooo good! I have been telling my husband for over a year now I wanted to try Silk brand products and I am so glad I did. I am hooked now. There is also a chocolate version of the Pure Almond, I had the vanilla, it was all out of stock at our store but I will keep my eye out for it. I really want to try it! You can find what store carries Silk near you at the store locator. 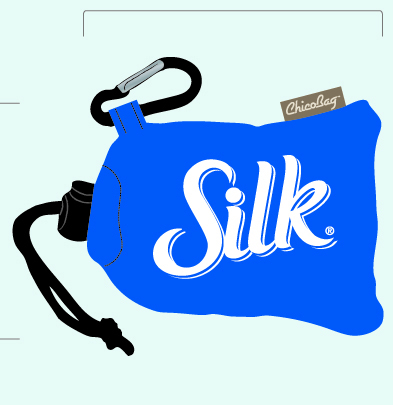 To start off on your own Silk for Milk challenge you can download a Silk Coupon here. 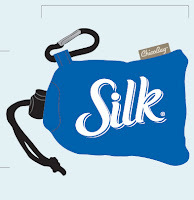 Silk has offered one of our readers the chance to win a Silk branded Chicobag and a coupon for a Free product coupon so you can try Silk too. 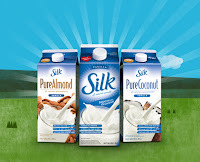 Tell me what would you try to switch from Milk to Silk in your daily routine? *Limited to US residents; 18 years old and above. Giveaway starts May 13, 2011 and ends on May 28, 2011 at midnight PST. Winner will be emailed and has 48 hours to respond before another winner is selected. I was not paid for this giveaway or post. I was provided for free one Silk product coupon for this review. The opinions are 100% mine and may vary from others. I would like to try it in order to reduce calorie intake! Entered in the Soft Lips giveaway! I have developed problems digesting milk as I have gotten older but have been on a Lucky Charms kick lately. Lol. I have them at least once a day. I would love to try Silk with them. 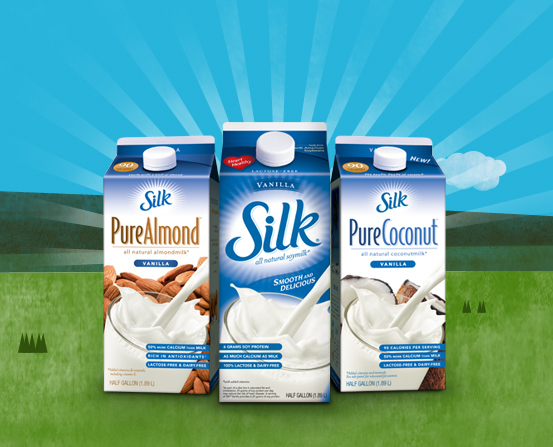 I'd like to try the silk coconut milk because I've always wanted to try it and it sounds delicious! I'd use it in a smoothie too! I would switch from milk to silk for shakes and cereal to avoid dairy products which tend to pile on the pounds and worsen allergies. My husband has already switched over due to health reasons, from ulcerative colitis. I would use it to make French toast and pancakes in the morning. Follow Frugal Family Tree on GFC entry #2. I Follow Silk on Twitter entry #1. I Follow Silk on Twitter entry #2. I Like Silk on Facebook entry #1. I Like Silk on Facebook entry #2. I voted for you for Were on the Fence entry #1.
voted for you for We're on the Fence entry #2.
voted for you for We're on the Fence entry #3. I entered the Lysol Allergy-Proofing Your Home Giveaway. I entered the Softlips So You Lipcare Pack Giveaway. I entered the Yoga By the Dozen DVD Giveaway. I entered the Lovable Labels Book Worm Labels Giveaway. I really dislike the taste of milk. Silk is an amazing alternative! It had the benefits of milk, but a much better taste. So, I would use it to replace the milky taste! I think it would be wonderful on my morning oatmeal! I want to replace the milk in my cereal with silk! I entered the lazy gourmet giveaway. i would change the milk i use for my cereal! I LOVE silk! I recently became lactose intolerant, and thought I would never be able to enjoy awesome things like cereal! Silk is great and the chocolate is awesome too! I like to drink it straight, but I could put it on my cereal. 2.I follow them on twitter(donnak4). 2.I follow you on twitter(donnak4). I would switch my milk in my cereal.